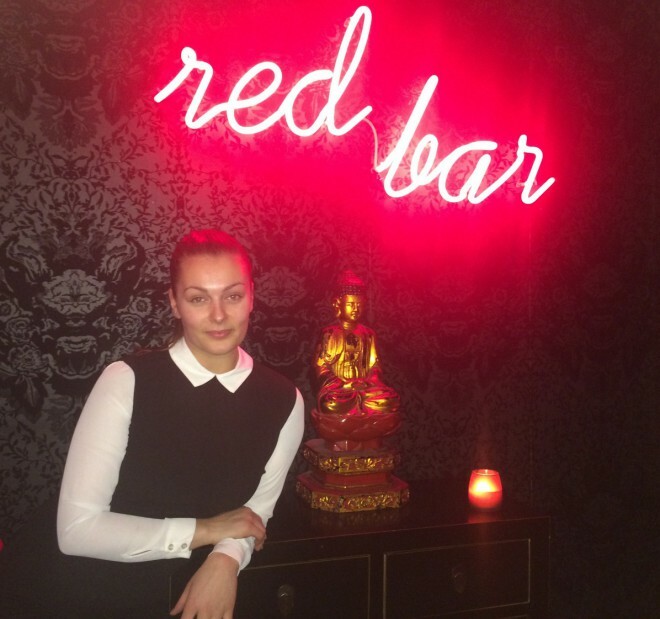 I’m Mimi Lorandova, I’m a bartender at Red Bar at Bam-bou, London. I am 25 years old and from Slovakia. I moved to London 7 years ago to go to university and worked part-time as a waitress in a restaurant. On my first day working there I saw what the guy was doing behind the bar and I knew that it was what I wanted to do. As often as I could I went behind the bar to learn and I became more and more passionate about it. Of course the bartender was handsome (even more when he was mixing), but yes it was about cocktails as well. It’s as simple as that. I would like something very small, homely, family based, like you have walked in to someones kitchen, similar to the top floor of Opium bar in London. Everything always happens in a kitchen… kitchens are the place to be, plus it makes you feel like home. I would have jazzy music like the 20’s-30’s-40’s style of music. People can see you prepare the cocktails and the whole place would have a relaxing atmosphere. What you’d find there would be nice cocktails, wine and of course a lot of champagne my favorite drink. And because we are in a kitchen, bar snacks to nibble, like small sandwiches. Difficult to say what would be my favorite spirit to work with, because when you prepare a menu you are thinking of the right balance of different spirits in it, so all the customers can find something they like. Otherwise my favorite one is champagne. If I have to prepare a cocktail for myself, it would be champagne based, because of the bubbles. I love blanc de blanc and the dryness of it. You can start and finish with champagne, you are not obliged to change. It’s not like you begin with something sour so you need something to cut through after that. So when I make cocktails it’s with bubbles and if possible champagne. The love a bartender puts into the cocktail. You must taste the love. I like bitters and even more angostura bitters. It just gives a cocktail another level, it elevates all the flavours with just a couple of dashes. There is bar in Prague called Black Angels, it used to be a dungeon. It was a part of a hotel that they did not use, so they transformed it into a bar. When you go down there you can feel the history, a coldness coming towards you and you feel like you are travelling in time. Everything was left as it was. The bar is gorgeous, it has massive baroque mirrors and chandeliers. It’s definitively a place worth visiting.